Well what a week it has been in NASCAR. Who would have thought that the biggest race in NASCAR would have ended on the account of rain? Not taking anything away from Matt Kenseth who ended up winning, but this race should have been at the very least post-poned until Monday so that they could finish. Matt led hardly one lap before the caution came out for rain and then not long after, they called it. Oh well. Also did Dale Jr take out Vickers or was it just racing? You decide. Now we are in California and the restrictor plates will be off for awhile and we will get to see some real racing. Hang on to your ballcaps folks! Let’s go racing! Go Kasey Kahne! Go Jimmie Johnson! Go Bobby Labonte! Go Martin Truex Jr! And in the other season that started this weekend, the Bassmasters Classic is still going through the final weigh-in out in Shreveport, LA. I will update you with the winner as it comes in but as it stands now Mike McClelland from Bella Vista, AR is in the lead with a weight of 52 pounds 1 ounce with a limit of 15 fish over the three day tournament. For the 51st time in NASCAR the Daytona 500 will get the green flag to start the 2009 season in 16 days. This race is the Superbowl of NASCAR. Why? Well for the most part it is made up of last years winners, previous champions, and all the all-stars from the sport. But this year NASCAR and the France family in their infinite wisdom has thrown a curve to all us fans. It could be good, but some purists (like Dale Jr.) don’t really like the new format. Before the 500 there are races called the Bud Shootout where past pole winners and race winners from the previous season get to race each other to get into the 500 (really its just for starting positions, they pretty much all make it in if they were in the top 35 in owners points). But this year with all the changes to teams and drivers switching to different cars, its a little fuzzy. For example, Ryan Newman (NEWMAN!!) who WON the 2008 Daytona 500 and got a pole in race 8 at Phoenix will not be elegible for the Shootout and thus will not be able to defend his title. Why? Because the owner points he got while racing for Penske in the #12 Dodge will not transfer over with him when he sadles up in a new Chevy racing for Stewart-Hass Racing. Terrible isn’t it? Yeah I agree. NASCAR is taking the top 6 teams and one wildcard from each manufacturer for the Shootout. Here is the unofficial lineup. One last thing, if you did not get to see the movie The Ride of Their Lives you can order the DVD. It was a great movie. The second number signifies the start of the Bassmasters Tour for 2009, which gets underway on Feb 20th, 21 days 14 hours from now. The Classic is the Superbowl of bass fishing as well (odd that they have these at the beginning of the season huh?). This year the Classic will be at the Red River in Shreveport-Bossier City, La. Qualifying for the Classic is similar to the Daytona 500. Last years Champion, Alton Jones is in. The top 36 anglers in the Angler of the Year competition are also in. Here is a chart that shows who is in and how they got there. The Federation Nation and Weekend Series champs are basically amteurs. And for the first time there will be a woman competing in the Classic. 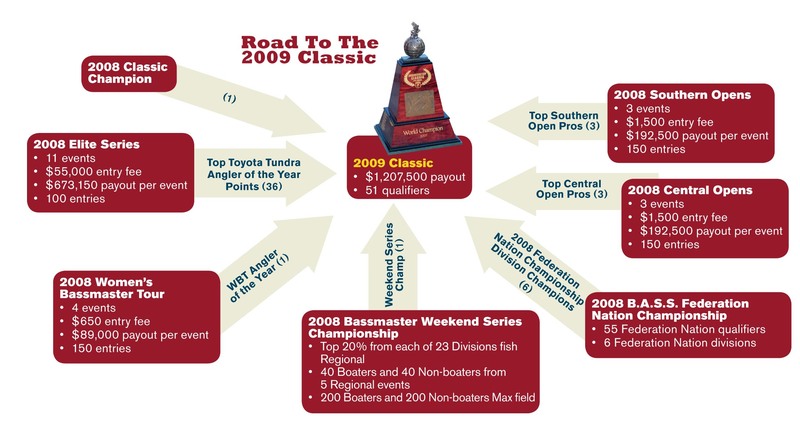 It will be Kim Bain, who is the WBT (Women’s Bassmaster Tour) Champion from 2008. It will be a Classic indeed. Can you believe it? For the first time in 38 years there will be a woman in the Superbowl of this great sport! Cool! Good for her and I wish her good luck. Read her story on the link above, its a good one. 2009 is looking to be a great year in NASCAR and Bassmasters fishing. Hope my DVR can handle all the excitement!